Inspired by the figure of Tethys – a sea goddess in Greek mythology, the daughter of the sky (Ouranos) and of the earth (Gaia) – Julius von Bismarck has conceived the original project “Die Mimik der Tethys” (the expressions of Tethys), for which he has moved the oceans. 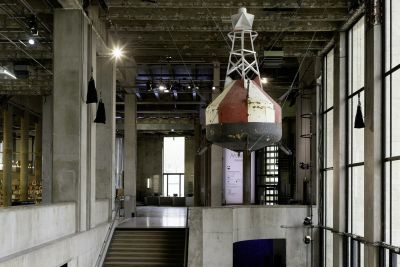 That is at least the sensation produced by the presence of a buoy hung over the Palais de Tokyo’s Palier d’honneur, corroded by sea salt and covered by dry seaweed. In perpetual motion, the buoy reproduces the movements of its original setting, off the Atlantic coast. It is in this way that the visitors find themselves metaphorically under the ocean, and can directly perceive the sway of its waves, which can be either gentle, or wild. The artist works on the human perception of natural phenomena, either by using highly technical approaches, or by simple site specific gestures. As he puts it: “it’s about the perfect image we have of nature. In reality, it doesn’t look like we imagine it does in a Caspar David Friedrich pastoral painting.” The astonishing sensation created by his moving buoy does indeed depict a misappropriated or modified vision of nature, transforming the building into a submarine world, paced by a giant pendulum that obeys only itself. “Die Mimik der Tethys” works like a barometer of nature’s moods. As a random alternation of moments of calm and violence, this hypnotic installation plunges the visitors into the heart of an immersive relationship with nature. Far from being idealised, it takes over the Palais de Tokyo and is unveiled in an extremely unstable way, a tireless heaving that reminds us of the tender osmosis that links us, just like our vain desire to control our environment, with the risk of utterly destroying it. Julius von Bismarck was born in 1983 in Breisach am Rhein (Germany), he currently lives in Berlin. He is a graduate of the Berlin University of the Arts (UDK) and the Institute for Spatial Experiments funded by Olafur Eliasson, who was his teacher until his Master’s degree in 2013. Associating visual arts to other fields of research and experimentation, such as physical and social sciences, Julius von Bismarck’s artistic practice can take on various forms – from installations to happenings, from sculpture to Land Art. It is defined by an in-depth and complex exploration of the phenomena of perception, or the representation and reconstruction of reality. The artist has had numerous of solo shows in Germany, including the Kunstpalais Erlangen (2018), the Städtische Galerie Wolfsburg (2017), the Kunstverein Göttingen (2015), the Kunsthalle Arnsberg (2014)... He has also taken part in international group exhibitions, among which “Power to the People” (Schirn Kunsthalle, Frankfort, 2018), the 1st Antarctic Biennale (2017), “The End of the World” (Centro per l’Arte Contemporanea Luigi Pecci, Prato, 2016), or “Fire and Forget” (KW, Berlin, 2015). He was the winner of the Ars Electronica award in 2008 for his project “Image Fulgurator”, while in 2012 he was the first artist in residency at the CERN, or the “European Organization for Nuclear Research”. Julius von Bismarck is represented by the galleries Sies + Höke (Düsseldorf), Alexander Levy (Berlin) and Marlborough Contemporary (London / New York). The artist has previously shown his work at Palais de Tokyo, in the context of a performance in 2013. He has had numerous of solo shows in Germany, including the Kunstpalais Erlangen (2018), the Städtische Galerie Wolfsburg (2017), the Kunstverein Göttingen (2015), the Kunsthalle Arnsberg (2014)... He has also taken part in international group exhibitions, among which “Power to the People” (Schirn Kunsthalle, Frankfort, 2018), the 1st Antarctic Biennale (2017), “The End of the World” (Centro per l’Arte Contemporanea Luigi Pecci, Prato, 2016), or “Fire and Forget” (KW, Berlin, 2015). He was the winner of the Ars Electronica award in 2008 for his project “Image Fulgurator”, while in 2012 he was the first artist in residency at the CERN, or the “European Organization for Nuclear Research”. Julius von Bismarck is represented by the galleries Sies + Höke (Düsseldorf), Alexander Levy (Berlin) and Marlborough Contemporary (London / New York).